The Historical Blogosphere has a Carnival, an Early Modern and Ancient/Medieval carnival, even a Bad History carnival, but it doesn’t yet have a regional carnival. The time has come. This is a call for submissions, suggestions and future hosts for the Carnival of Asian History Blogging. This will be a bimonthly carnival, appearing in even months on the same day as the number of the month (i.e. 2/2, 4/4, etc.). I will host the first edition here at Frog in a Well: Japan, Monday, October 10th, so get your submissions in quickly! You can send them to me (dresner[at]hawaii[dot]edu; please put something like “Carnival submission” in the subject) and you may submit your own work or suggest good posts by someone else. You may submit multiple posts, but not by the same blogger. The host, of course, is not bound by such restrictions, though we will attempt to provide as much geographical and chronological coverage as possible. For this first carnival, you have a unique opportunity to send the very best posts you’ve done (or read); subsequent carnivals will be limited to posts written since the previous installment. As always, host has final, absolute, and arbitrary authority with regard to inclusion, exclusion, scope, scale, format and presentation. You do not have to be Asian, an historian, or a carny (you do have to be a blogger, at least once); all you have to do is blog about Asian history. Our definition of Asia, for the purposes of this carnival, is pretty much the same as that of the Association for Asian Studies: East Asia, Central Asia, South Asia, North Asia, Southeast Asia, Far East, Middle East, Near East, all regions are welcome. Our definition of history (and of good blogging), for the purposes of this carnival, is pretty much that of the History Carnival. We don’t want to duplicate the current events/news roundups provided by Simon World, etc. : this carnival will focus on collecting the best English-language Asian historical blogging. The (in)famous 1945 Frank Capra propaganda piece Know Your Enemy: Japan can now be ordered very inexpensively as an extra on the $9.99 DVD of John Ford’s December 7th: The Pearl Harbor Story. It was previously available on video at a more expensive price here. I remember watching this movie some years ago and having bizarre mixed feelings of disgust and admiration for the work’s effective techniques. This info was passed on courtesy of Ian Miller, Asst. Professor at Arizona State University and a friend who has been wonderfully helpful with advice about graduate school since I met him at the IUC Japanese language program in 1997. He recommends the movie as material for teaching, combining it with readings from John Dower’s War Without Mercy. See his original comment posting this info here. Professor Akira Iriye gave a talk at the Reischauer Institute yesterday which, like most Japan Forum events, was open to the public. Iriye has been attending various conferences in this year of dual anniversaries for the end of the Russo-Japanese war and World War II and has been collecting impressions and insights that he shared with the audience yesterday. He divided his comments by looking at the two postwars from the perspective of the individual, its impact on the region, and broadly in terms of 20th century history. On the individual level he focused on the experience of Asakawa, Kan’ichi (1873-1948), who like Iriye, was a professor in the United States, and spent over 50 years in the United States. Apparently, as of this year, Iriye will have been in the country longer than Asakawa. Iriye contrasted the experience of Asakawa, who found himself frequently in an awkward position of having to balance and moderate between often extreme opinions on the Japanese and US side, with his own life in the United States, which he says shared none of these difficulties. In what was perhaps the most interested aspect of the talk Iriye discussed his own diary, which he started August 19, 1945, only days after the end of the war. At the time, he notes, he was apparently moderately nationalistic and felt awful about Japan’s defeat (his entries until the 26th, however, were dominated by discussion of how he managed to obtain food for that day). He posed an open question to the audience about how one makes a transition from such nationalistic views to a more internationalist perspective. He made such a change himself, describing himself now as anti-nationalist and internationalist, and suggests that in his particular case it was the cosmopolitan atmosphere at American universities and the American education system which is to credit for this change. He says that however critical he may be of the United States now, this has not changed. Later in his talk, when he made some comments on the implications for the broader 20th century Iriye made some bold predictions about the future, as he has made in previous talks and writings. If 1905 represents the true entry of Japan onto the world stage as a world power and empire, and 1945 represents the shift from a world dominated by empires to one dominated by the nation-state, Iriye sees the current trends towards an age of regional institutional forces, and especially, non-state “transnational” actors. He is strong about this claim, and believes it is “foolish” to believe that the nation-state can continue to be the primary force in the coming century. He is especially hopeful about developments towards a regional community in Asia. Finally, Iriye noted that Japanese opinion about the two wars has always been divided, and generally fall into two camps: those who celebrate the Russo-Japanese war and lament the defeat in 1945, and those who hold the reverse position. Iriye places himself firmly in the latter camp, believing that the 1905 was “disastrous” because it led to Japanese hegemony in Korea and China. In this respect, he seems critical of approaches that view, in his words, the conflict as a “war of civilizations.” As for 1945, Iriye argues that Japan’s defeat had the effect of forcing Japan to relate to the world in terms of economics, culture, etc. thus positioning it well to face the challenges of the future. Slightly embarrasing to admit though since my own research is in the sengoku era but I have started to wonder about one thing and anyone might have heard the reason. The second Tokugwa Shogun, Tokugawa Hidetada, recieved the first kanji, hide, from Toyotomi Hideyoshi. Yet he did not change his name, a well established custom, even though Tokugawa attacked Toyotomi during Osaka sieges 1614-15. Does anyone know why he received the kanji from Hideyoshi? The reason to why he did not change might be harder to find I guess. Last time I was in Japan I went through a lot of bookshelves looking for relevant litterature for my research. At the library of Gifu university they have a lot of books that belongs to old universities and such and these books are not a part of the library computer system. Thus, one has to look through the books in person, which I really like. There are many books which are older and most has not been touched by anyone during the last 20 years or so. Among these books there is a book called ”戦国時代和歌集” published 1943 (First two kanji in older style but my computer cant write them). In this book, as the title so says, there are a lot of poems from the sengoku era with authors such as Tokugawa Ieyasu, Oda Nobunaga and Toyotomi Hideyoshi to name a few. From the context of the intended invasion of China- which stopped in Korea and therefore has been labeled “war in korea”- this poem shows his ambitions. In both situations, a country shamed in military defeat felt persecuted, giving rise to politics of emotions, especially with regard to neighboring countries; I don’t have any idea what this means with regard to Japan, except that people still bring up WWII on a pretty regular basis, which is embarrasing. I guess that must be it. In both situations, this “public pathos” was tapped to become an essential element in the political contest for votes, in the suppression of rational politics, and in the push toward a hawkish road; When was the last time you saw an election in which an appeal to “rational politics” succeeded? Seriously, though, Japan’s desire to rationalize its relations with its neighbors (in other words, to dominate them economically, instead of feeling guilty) was an element in this election, though far from a central one. They both want to revise the constitution to give their leadership and their successors more power, and to normalize the military by resurrect the nation’s army. Japan’s military doesn’t need “resurrect”ion: it’s already one of the most powerful on the planet, in technical terms, and one of the best-funded. Hitler’s power came through emergency decrees and something a bit more drastic than constitutional “revision.” Koizumi is, so far, sticking to the usual amendment process, and is well aware of the likelihood of failure in the referendum approval stage. Plenty of countries have endured stronger executives than Japan’s current Prime Ministers without going fascist. This came across the H-Japan wires, and I was intrigued by both the project itself and the immense time-wasting potential of listmaking, so I wrote to Ms. Kim and got some clarifications, and now I’m ready to putter furiously…. I recognize these are crude time periods and some of you may be experts in Tokugawa versus Meiji Japan, or there may be overlapping leaders across time periods. That’s okay. I would be grateful if you can fill in any of the periods that you are familiar with. Of course, I’d be happy to share the results with all interested parties. Here’s my nominations, mostly off the top of my head. If I was a really good blogger, I’d include links with all these names to something like their wikipedia entries, but I’ve blown enough of a Friday on this already, and none of these folks is obscure. 1840-1860: Well, part of the problem in this era is the lack of coherent leadership. There’s the short-lived Shogunal leadership (Ii Naosuke, Abe Masahiro), and the rising mid-level elites (Okubo, Saigo). Aside from that, I’m not sure who I’d really pick as outstanding. Yoshida Shoin? 1860-1880: Although this violates the normal 1868 boundary, the rising stars of the Bakumatsu cover this ground pretty well. Okubo Toshimichi, Saigo Takamori and Kido Takayoshi, of course are all leading figures and all die just before the end of this period. I’d probably include Fukuzawa Yukichi due to the influence of his writing and cultural leadership. A conventional list would probably include Shibusawa Eiichi as an economic leader, too, though perhaps his heyday is later? Iwakura Tomomi. Other names would come from the second-tier Bakumatsu/Meiji leadership: Okuma Shigenobu, Ito Hirobumi, Itagaki Taisuke, Mutsu Munemitsu. The eternal debate: to include the Emperor or not? 1880-1900: This is, perhaps, the most stable of these eras, even though it crosses the Constitutional divide. Ito Hirobumi, Yamagata Aritomo and the Meiji Emperor have to top the list. Okuma Shigenobu gets high marks as an opposition rabble-rouser. Mori Arinori, Matsukata Masayoshi, Inoue Kaoru, Saigo Tsugumichi. There ought to be a business leader or two in here, but those names never stuck with me very well. 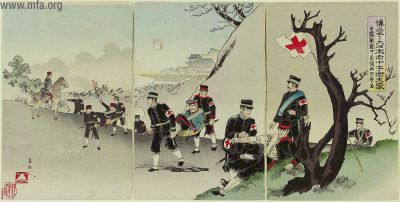 1900-1920: Yamagata Aritomo and Matsukata Masayoshi; Saionji Kinmochi, Hara Takashi and Katsura Taro. I think Ito Hirobumi should make the top ten, even though he dies half-way through, but it depends on who else is near the top. Culturally speaking, Natsume Soseki. Nogi Maresuke is popular and makes an impact when he dies, but is he a top-ten leader? What am I missing here? Obviously, the floor is open for discussion. (and later I will allow myself the luxury of looking at a textbook to see what I missed) This is part of a World History project including “US, Britain, Spain, France, Germany, Italy, and China” so almost everyone gets to play! Lots of folks are pretty sure that the success of Koizumi’s rejuvenated LDP in yesterday’s elections [here’s a good summary] means something. What? It seems to me impossible to know what it means in a policy sense, but it clearly marks a step in the evolution of party politics and campaigning… a step away from past verities, but not necessarily towards anything easily recognizable or categorizable. For myself, the privatization of the Postal Savings and Insurance system would mark the end of something historically interesting. The Postal Savings system was a fundamental institution in the Meiji modernization, enabling reliable low-cost long-distance transactions (including remittances from overseas, which is where my research comes in) and accumulating small deposits into a pool of capital that was agressively used for investment in railroads and other heavy industrial development. The great success of what is now the largest financial institution in the world is part of what forced me to recognize that the “rational actor” theory of economics which I had disdained for so long did in fact have its moments: the speed with which Japanese peasants adopted newer and more reliable banking institutions (and avoided less reliable ones) was a remarkable demonstration of fiscal sophistication and self-interest at work.